As part of STWR’s ‘global call for sharing’ campaign, we are periodically highlighting the growing public debate on the need for wealth, power and resources to be shared more equitably both within countries and internationally. This debate is becoming more prominent by the day, although it is often framed in an implicit context without directly acknowledging how the principle of sharing is central to resolving today’s interlocking crises. The people’s voice has taken centre stage once again in recent months, in which a call for sharing is palpable in the many agendas for social justice and true democracy. To recall just some examples, mass demonstrations in Iceland forced the Prime Minister to resign following the Panama leaks; thousands marched for an end to austerity policies in the UK and other European countries; public sector workers in Costa Rica called national strikes for such demands as tax justice and the defense of public healthcare; and ordinary citizens joined migrants and asylum-seekers in the streets of Athens to march in protest against closed borders and the EU-Turkey deal. Many are asking if we are in the midst of a new cycle of popular uprisings that are reminiscent of the movements that began in 2011, especially in light of the ongoing ‘Nuit Debout’ meetings across over 30 cities in France. Although these vast nightly assemblies arose out of opposition to labour reforms proposed by President Hollande, they have soon expanded to include major sharing-related themes on everything from tax evasion and unjust trade treaties to housing inequality. The call has now rung out for an international day of action on May 15th, a so-called #GlobalDebout, that will invoke the spirit of the Occupy and 15M movements through a worldwide ‘convergence of struggles’. Last month also saw an unprecedented mobilisation of campaign groups and activists across the U.S. in a concerted call for getting big money out of politics. 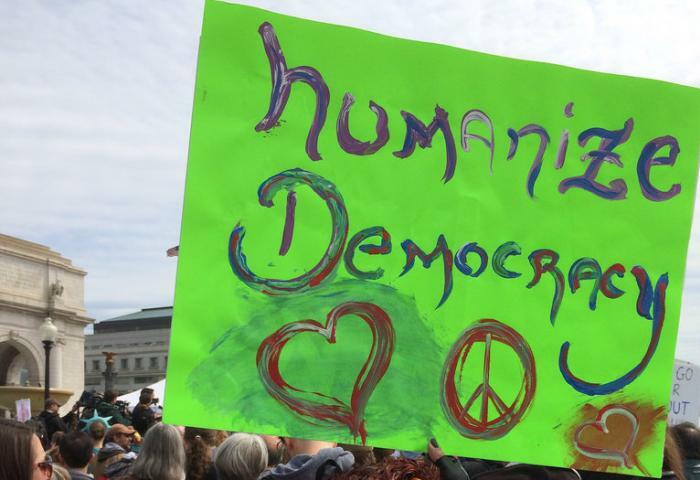 The ‘Democracy Spring’ began with a walk of 140 miles from the Liberty Bell in Philadelphia to the nation’s capital, where hundreds of people participated in six-straight days of non-violent civil disobedience, leading to over 1,400 arrests. Despite a distinct lack of coverage in the mainstream media, the week of rallies and teach-ins may have been the largest democracy-focused protest actions in a generation, and they signalled the beginning of a renewed push for nationwide reforms to campaign financing and voting rights, including a constitutional amendment to overturn Citizens United. As the campaign materials emphasise, there cannot be a fairer sharing of wealth and power in American society – nor a just solution to the most pressing crises of our times – as long as many ordinary citizens are shut out of the political process, and while the campaign finance landscape allows big money to increasingly shape elections and the policymaking process. For an altogether different take on the next stage for global activism, a book by STWR’s founder Mohammed Mesbahi will be published this month that proposes a far-reaching vision of peaceful protest that can unite the populations of all countries through enormous and continuous demonstrations. In a unique and provocative analysis, Mesbahi proposes that men and women of goodwill adopt Article 25 of the Universal Declaration of Human Rights as an overriding cause in the immediate time ahead, which he argues has profound implications for the future direction of international politics and global development. Yet such a simple cause is still far from the thinking of most activists who remain preoccupied with national issues of inequality and injustice, while there is scant public attention paid to the millions of needless deaths that occur due to hunger and poverty each year. Part of the problem is a paucity of reliable global data about the true extent of the crisis of poverty, which has been addressed in some important work by Dr Jason Hickel of the London School of Economics. We’ve previously highlighted some of Hickel’s research that contradicts the “good news narrative” touted by the mainstream media that poverty levels have been dramatically reduced in recent decades, and that we are on course to end poverty altogether by 2030. On the contrary, Hickel shows that there are more people living in poverty today than ever before in history – more than 60% of humanity, and the situation is getting worse rather than improving. Most of these proposals focus on reforms to the U.S. financial and tax systems, such as ending preferential tax treatment for capital-gains income; steep taxes on luxury consumption to help underwrite a just transition to a clean-energy economy; funding tuition-free public higher education through a modest wealth tax; and a serious crack-down on tax havens through a new worldwide register of financial wealth, among other reforms. But the authors recognise that we can’t address structural and cultural unfairness through redistributive tax policy alone; we also need to challenge the powerful narratives that justify extreme inequality, and forge campaigns that empower large constituencies to fight for game-changing solutions. Another valuable contribution to the inequality debate comes from a newly released report by ActionAid called The Price of Privilege, which provides an accessible overview of current civil society thinking on the various forms of inequality that mar the global community. As the report emphasises, we already know what it takes to reduce inequality within countries, as history shows how a combination of strong social protections, industrial policy and progressive taxation lead to economically more equal societies. However, considering the alarming scale of inequality within most nations – particularly inequality in the distribution of wealth, which underlies many other injustices – the report recommends a number of measures to “rebalance power” in our political systems and “change the mindset” that sees no alternative to the status quo. See in this regard the second chapter on how to challenge the dominant economic narrative by exposing its 7 key lies, such as “Inequality is necessary to generate economic growth”, or “If people can’t get as rich as they like, economies will grind to a halt as wealth creators ‘go elsewhere’.” Citing the hopeful signs from the past that a shift towards greater equality is ever viable despite current trends, the report concludes on an optimistic note that a fairer sharing of the world’s resources is not only possible, but on its way. To paraphrase from an article by one of the report’s contributors, it’s not enough to ask global leaders to agree that inequality is a problem; we need to build people’s power from below to pressure leaders to act, which is the only path to achieving transformative social change. In this brief and very selective round-up of recent highlights on the inequality debate from within the progressive community, we should also mention the much-anticipated documentary, The Divide, that was recently released across the UK (in the same week that the revelations from the Panama Papers were being pored over internationally). Based on the bestselling book The Spirit Level, the film does an estimable job of bringing to life the basic arguments made by Richard Wilkinson and Kate Pickett – that income inequality is the underlying cause of most modern social ills, from violence and depression to drug abuse and ill health. Although the narrative of the documentary (like the book) is not positively framed around the need for a renewed culture of genuine economic sharing and cooperation within our societies, the message is implicit throughout its sweeping portrayal of how the past 35 years of divisive economic policies have led to greater unhappiness, disaffection and hardship for the majority. Amidst these many discussions on inequality that are inherently related to the case for sharing, there’s one subject that has seemed almost impossible to avoid so far this year, which is the enormously popular idea of a universal basic income (UBI). Long supported by all manner of thinkers from both the left and right of the political spectrum, this previously fringe policy idea is now being seriously considered by some governments as a solution to precarious employment models, inadequate social protection systems, and a future low-work society due to technological unemployment. Switzerland will be the first country in the world to vote on a launch of the idea in June, while Finland, Holland, Canada, New Zealand, Namibia and other countries are discussing or testing out the policy. So could state-administered UBI schemes help or hinder the creation of truly sharing societies, and can such policies benefit citizens in developing countries and ultimately help to end poverty or protect the global commons? While there isn’t space here to go into these questions (although see here for a big picture vision from STWR on funding basic income schemes by sharing the value from common pool resources), a number of public events this month are debating the implementation of a UBI with various prominent speakers. For example, the Future of Work conference in Zurich this week was attended by Yanis Varoufakis, Robert Reich and other well-known progressive academics; Caroline Lucas in the UK, who tabled an early-day motion in the House of Commons about UBI, is headlining an event in Westminster later this month to discuss the prospect of implementing a scheme within Britain; and a UBI conference in Hamburg, Germany on 21st May aims to create a dialogue between the movements for degrowth and basic income within Europe. There is even a proposal from Scott Santens that May 1st, known as International Workers Day in celebration of the historic achievements of labour unions, should also be championed worldwide as Basic Income Day. “Furthermore, as the Club of Rome already realized in 1972, the productivist bias of our usual answers to inequality – grow more, produce more and grow the economy so that people can consume more – is ultimately unsustainable. Surely, in a world already characterized by overproduction and overconsumption, producing and consuming more cannot be the answer. Yet, these seem to be the answers with which we are stuck: grow, grow, grow. This leads on to a final issue that is worthwhile to mention in this short roundup of sharing-related news and developments, which is the limits to growth debate that has recently been given a high profile in both policy and campaigning circles. In the UK, an All-Party Parliamentary Group (APPG) was launched in the House of Commons in April to review the scientific merits of the controversial report by the Club of Rome that was published over 40 years ago. The aim of the APPG is to stimulate a cross-party dialogue on “prosperity within limits”, exploring the economic risks associated with resource constraints and planetary boundaries. A short review of the limits debate was compiled by Tim Jackson and Robin Webster, two academic specialists on the issue, who found unsettling evidence that society is still following the “standard run” of the original study, in which overshoot leads to an eventual collapse of production and living standards. In other words, the limits to growth arguments are more relevant today than ever, and present a stark challenge to the prevailing assumption that the only way to bring about widespread affluence, as well as greater equality, is through the perpetual growth of GDP. The APPG report’s analysis makes clear that new impetus must be given to efforts to redefine prosperity in a way that is more in tune with human nature, the natural environment, and their interrelationships. And the relevance of sharing in all its forms could not be more pertinent to these new visions of a better world that “provide the capabilities for everyone to flourish, while society as a whole remains within the safe operating space of the planet”. There are plenty of resources available that give an inspiring insight into what it means to embrace this new ethic of sharing and sufficiency, among which is a recent paper by Samuel Alexander of the Simplicity Institute that explores the government policies that could facilitate a planned transition beyond growth. The latest campaign from The Rules team also makes a compelling case to “connect the dots” between the great converging crises of our time, beginning with a realisation that the logic of “growth at all costs” is at the root of our problems, the “one sacred rule” that we will eventually have to break. As always, the summary above is merely an overview of some of the debates, events, campaigns and activism that relate to the growing call for sharing, and there are invariably many other issues that could be highlighted. This would include progress on trade justice campaigns in light of the TTIP leaks from Greenpeace; the shameful politics of the refugee crisis within the European Union; the state of play with overseas aid as we approach the World Humanitarian Summit (tweeting under the hashtag #ShareHumanity); or the fading vision of ‘fair shares’ in tackling climate change now that nations have signed the COP21 agreement. We’ll continue to highlight and frame some of these issues in terms of sharing in future blogs and editorials, and you can keep abreast of what we’re reading at STWR by following our Twitter and Facebook feeds, as well our Scoop.It! page that is regularly updated.